Weeds are plants in abundance in the wrong place at the wrong time - from our human perspective. Wrong place is where we are growing plants we have a use for and wrong time is when we are growing them. This is simple enough when it is a serrated tussock grass that is inedible to livestock invading a pasture or a creeper strangling a tree - but it is worth considering other situations. Recently, I spent a summer night in a dilapidated cabin on a farm. Plants were making their way across the paved floor amongst more rodent droppings and bat guano than seemed healthy. Cobwebs hung from all the rafters and the mustiness of months of dust attacked the nostrils. Nature was reclaiming what was hers. After a little time sweeping out, I took a stroll down to a nearby creek in the hope there was a good swimming hole. The water was too low to swim but was surprisingly cool on the feet. I sat and contemplated. As the world went slowly by, I munched on handfuls of wild blackberries. The spot was shady, the water running free and the berries as sweet as great-grandmas jam. Small insectivorous birds were flying in and out of the blackberry thicket, happy to find cover and foraging space. I sat for half an hour in that idyllic spot and began to wonder why the conventional conservation wisdom would have the blackberry bush ripped out. The issue was that this was an Australian creek, and blackberries (the Rubus fruticosus group) are declared a Weed of National Significance with strategic plans for eradication and control. Except there, by the side of a quiet creek, the plant appeared natural. It was healthy, producing fruit, providing cover for birds and helping to stabilize the creek bank. It wasn't a native though, it was an invader. On the way home I purchased two punnets of blackberries from the grocer for $4. I tasted one of these berries that looked perfect but compared to those by the creek it was bland and lifeless. So is blackberry a nasty invasive or a plant with tasty fruit? The dictionary says a weed is a plant considered undesirable, unattractive, or troublesome, especially one growing where it is not wanted. A plant that is troublesome, that grows where we don't want it, such as amongst our crops, along water bodies and in our gardens - or as an alien species. This definition is arbitrary as one person's desire, attraction and trouble is rarely the same as another. In the end it is a plant growing in abundance in what we decide as the wrong place at the wrong time. Climate change will see many plant species where we don't want them. Several plant species will respond to warmer temperatures and altered rainfall patterns to grow where they are not wanted. Other species that are already invasives will proliferate either because they disperse more easily or propagate more readily. Where agriculture is pushing the natural system to limits of productivity only very slight climate shifts are enough to trigger an infestation. This is because many species that become weedy are opportunists that do well in disturbed or degraded conditions. Climate change will make management more acute. Rather than reach for the herbicides, we could use the increased incidence and intensity of outbreaks to review what we understand by a weed. Most plant species perform valuable functions in habitats, especially stabilizing and adding carbon to soil, it's just that some of these functions we label as undesirable when they interfere with those functions we want. Willows, tree species of the genus Salix, are common along streams and in wetlands. In their native Europe these species help create some iconic habitats. 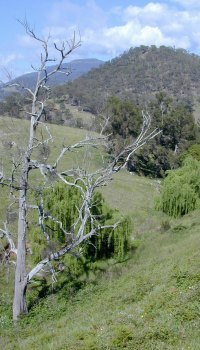 However, they are not native to Australia and are being removed by the thousand from creeks and streams despite the fact that they stabilize the banks, often are the only tree that shades the water, provide litter and organic matter to stream invertebrates and the mammals, fish and birds that thrive on them. Once removed the stream is exposed in every sense. Exposure seems an odd thing to be creating when the climate is changing.